Peruvian President Pedro Pablo Kuczynski speaks to reporters outside the West Wing of the White House in Washington, Feb. 24, 2017, after a meeting with President Donald Trump. The first Latin American leader to visit U.S. President Donald Trump at the White House said on Friday that he told Trump he prefers bridges to walls and favors the free movement of people across borders. However, Peruvian President Pedro Pablo Kuczynski declined to comment specifically on Trump's proposal to build a wall along the U.S.-Mexican border to curb illegal immigration and drug trafficking in a press conference following the meeting. "I don't want to get into the wall," Kuczynski, a former Wall Street investment banker said in a video distributed by his office. "We're interested in the free movement of people ... I emphasized that to President Trump and we prefer bridges to walls." Kuczynski has previously likened Trump's wall proposal to the Berlin Wall and once joked that he would cut off ties with the United States if Trump were elected president. Kuczynski later congratulated Trump on his surprise electoral victory and described their talk on Friday as "cordial and constructive." Trump called Peru, a country of 30 million in South America, "a fantastic neighbor" and said it was an honor to have Kuczynski in the White House, according to video showing the two posing for pictures after the meeting. Kuczynski said the two leaders only briefly discussed Peru's fugitive former President Alejandro Toledo, whom Peru had asked Trump to deport from the United States under a provision of migratory law that allows for deportations to preserve diplomatic ties. "This is a matter of the judiciary that was not discussed for more than a few seconds," Kuczynski said of Toledo. Up until a week ago, Kuczynski's centrist government had seen deporting Toledo as a better alternative to a potentially lengthy process of Peru's judiciary seeking his arrest and eventual extradition. 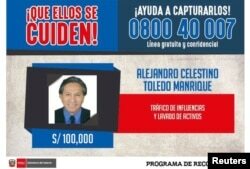 Toledo is wanted in connection with a far-reaching graft probe and has denied prosecutors' allegations that he took $20 million in bribes from Brazilian builder Odebrecht SA. 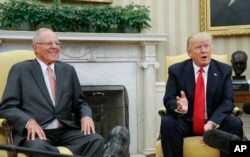 President Donald Trump meets with Peruvian President Pedro Pablo Kuczynski in the Oval Office of the White House in Washington, Feb. 24, 2017. In discussing migration, Kuczynski said he emphasized to Trump that only 70 Peruvians out of 1 million living in the United States are in jail, 200,000 of whom are there illegally. "Peru has not exported criminals to the United States," Kuczynski said. "They're nurses, they're doctors, they're all sorts of people."